The Mass GI is an extremely small and light isolation transformer supplied with the latest high-frequency electronics switch technology. 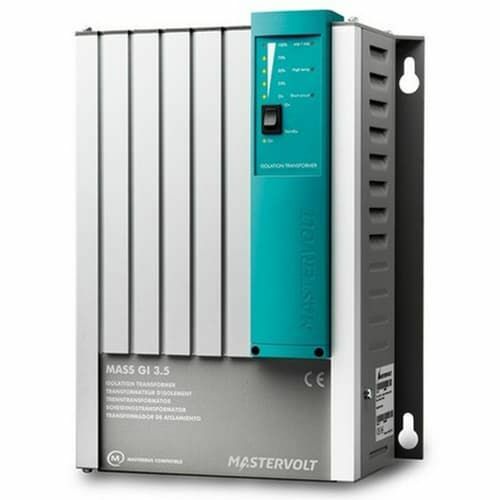 Suitable for 120 V and 230 V AC systems its capacity can be parallel coupled for higher capacity. Two units correspond to double its size. The Mass GI isolation transformer can be fitted in any position on a wall or floor. No rubber mountings are necessary because it does not vibrate or hum. The integrated Soft Start manages the current resulting from connection to the shore. A LED indicator on the box displays load data. Remote operation is possible via any MasterBus panel. There is also a connection for the automatic activation of the generator if shore power is overloaded. The Mass GI features marine aluminium casing and professional connections with strain relief cable glands. All Mastervolt isolation transformers comply with the CE and ABYC (US norm) guidelines for vessels.